Found on the southeastern coast of Kyushu Island, Miyazaki Prefecture is a land known for its natural splendor. Outdoors enthusiasts will find beaches great for swimming, surfing and all manner of water sport, interesting cliffs and rock formations, a lush evergreen forest, famous waterfalls, as well as a place where wild horses run free. Miyazaki also hosts its fair share of bustling city convenience, museums and sites that honor traditional culture for visitors to appreciate. A great wealth of activities are waiting for you on your golf-break. While Miyazaki's cities have a bit of night life; clubs and bars as well as izakayas (Japanese pubs) it's the other things unique to Miyazaki Prefecture that draw the most attention. With a unique rock formation known as “Devil's Washboard,” Aoshima Island is a highlighted haven for beach lovers. 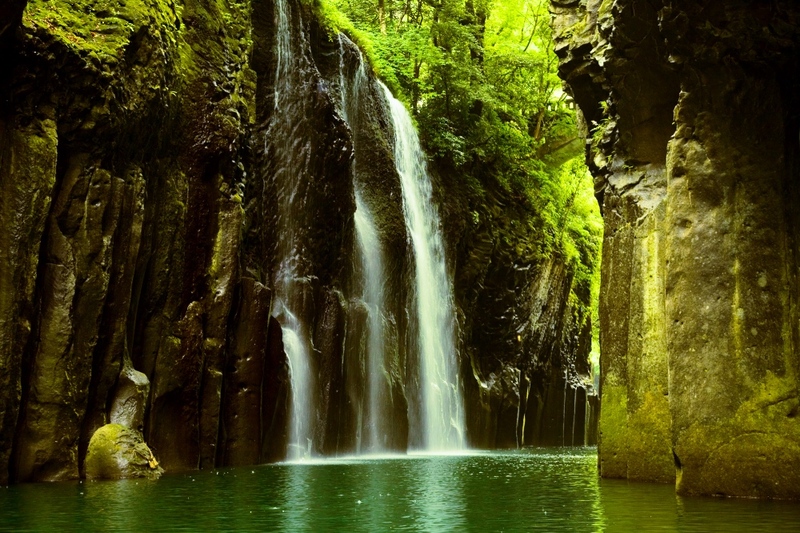 Explore Takachiho Gorge by strolling along a serene riverside, or take a boat ride for a different perspective. The stunning waterfalls and moss over trees in this serene, ancient place will inspire you. Traveling in Miyazaki you will also have the chance to visit shrines and museums, and if you are a bit more academic why not stop by the renowned science center. Of particular note is the Udo Shrine, which is located in a cave on a seaside cliff. Head to Obi area, to see an historic castle and town. The castle and region were fought over for centuries between the Shimazu clan who built it, and the Itou clan who later claimed and maintained it. Steep yourself in this tumultuous history. If you prefer a more relaxing time, onsens (hot springs), are a highlight in Miyazaki, found in both modern style hotel-resorts and more traditional Japanese style inns called ryokan. Yabusame, horseback archery, is still practiced by archers as a matter of tradition, and is a festival for public spectacle. Miyazaki's happens on the 3rd of April every year, when the cherry blossoms are usually at full bloom. Upon hitting the bull's eye, the target bursts into confetti to the enjoyment of the crowds. Kobayashi City holds a yearly Firefly Festival towards the end of spring. The fireflies, insects thought to represent love in Japanese culture, are obviously only visible after dark. But festival-goers often spend time around the area for what it has to offer before the night falls. In late August, a fire festival is held in Toi Misaki. For this event, a pine tree symbolizing a snake standing about 30 meters tall wrapped in straw is set ablaze. Many more things happen as the seasons pass, and a trip to Miyazaki will surely help you make a memories to last a lifetime. Chicken Nanban is a renowned Miyazaki original dish. Deep-fried chicken with a dressing made of vinegar and tartar sauce, originally only available in Miyazaki, now this dish is popular across Japan. Jidori-momoyaki is another chicken favorite, known for being made with all-natural poultry from Miyazaki and 100% fat free—a great choice for those who are conscious of their food options. Miyazaki Beef is also well known, the cattle are raised in a very natural and stress-free environment. This means the beef is of a supreme quality. Beef dishes also abound within the prefecture. Don't worry though, if you prefer seafood, the Ise Ebi Lobster is caught right off the coast and is often served raw as sashimi, when it's said to be most delicious. Some people are suprised to learn, Miyazaki is also known for its mangoes, soft and sweet when ripe! And be sure to try the local Shochu spirits, which are brewed by fermenting various things, including potatoes, wheat and corn. Why not skip all the normal touristy souvenirs and bring back two unusual tasty treats to remember your trip? Hyuga no Kaori Yokan is an unique traditional jelly from the citrus fruit hyuganatsu. A specialty of Miyazaki Prefecture, It's made by creating the jelly inside the husk of the hyuganatsu fruit. Obiten is another popular souvenir item, a fish cake which is made from fish and tofu, black sugar and miso. The combination of flavors makes it an interesting choice as a gift. Miyazaki is known to be a great albeit underrated tourist destination even among locals, and as such it has quite an assortment of hotels and accommodations to choose from. If you're looking for hot springs, the Miyazaki Kanko Hotel is a great and comfortable choice, even offering a free foot-only hot spring that even locals visit often. Want a more traditional ryokan? The Ryokan Odoso is a popular choice. It has its own restaurant, allowing you to experience Miyazaki in more ways than one. Miyazaki is a land of picturesque nature, rich history and culture. A golf trip to the prefecture will surely be a memorable one. With much to see and do, taste and experience, you may find yourself falling in love with the prefecture as you go around golfing. Miyazaki has its own airport. Flights from Tokyo or Osaka go to Miyazaki several times a day, so getting there isn't too difficult. It's also accessible by combination of trains and buses. From Tokyo or Osaka, taking the Tokaido-Sanyo Bullet Train to Fukuoka, then taking Kyushu's own Bullet Train can take you to Kumamoto, which is right next to Miyazaki. From Kumamoto, a 2 hour bus ride gets you into Miyazaki.